You can find the first installment on Ice Age block decks here. This article focuses on two additional decks prevalent in the block, Bugbind and the famous deck based on the card with it's namesake: Necropotence. 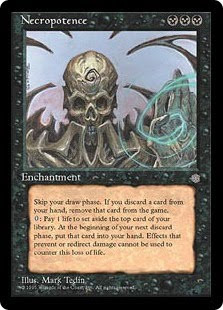 Necropotence is arguably one of the most powerful cards ever printed in Magic. It's ability to draw an excessive amount of cards in a single turn with the only caveat that you had to figure out a way to replenish life has made it extremely popular even in today's vintage format. That said, it is restricted in Vintage, thus you're only allowed a single copy. In Legacy it's outright banned, it's power level considered simply too great. In fact, the only format in which this card is neither restricted nor banned? Ice Age block constructed. How can we not want to try to exploit packing 4 copies of this card into a deck? Hell, why not 8 copies? Let's find another card banned in Legacy and restricted in Vintage: Demonic Consulation, and use that to find Necropotence at the first opportunity! The rest of this deck falls into place quite nicely. Previous incarnations of Necro have both split the control and aggressive sides of deck construction. Because of the other cards in the format, this Necropotence variant falls into the slower, more control oriented side of things. This deck packs 4 Necropotence to draw cards and 4 Consults to go find it, a number of mana acceleration tricks and big powerful game breaking effects like Mind Warp, Soul Burn and Soul Spike. Phyrexian Ironfoot serves as an early defender and Void Maw a late game finisher. Scrying Sheets allows us to fill up our hand without using life as a resource if necessary. The sideboard brings in Icequakes to deal with enemy Scrying Sheets or Kjeldoran Outposts, Mind Ravel to find permission magic, Contagion for creature rush and Dystopia for pesky enchantments we couldn't otherwise remove, like Circle of Protection: Black or Stormbind. I like Jester's Cap for the mirror match. Cap their Necro before they cap yours? Win the game. Bugbind was prevalent on the original ALICE tournament scene and piloted by Magic Pro Tour Hall of Famer Olle Rade in one of the first block constructed tournaments. His deck used Stormbind and other "bugs" like Giant Trap Door Spider, Wooly Spider and Deadly Insect. Some of those creatures are since made obsolete with the release of coldsnap and superior creatures that fit into this version. Ohran Viper is a powerhouse creature, Boreal Centaur a fast beater and Brooding Saurian a fat finisher. Bugbind packs less burn than Sligh, but only slightly so and Stormbind allows us to make up for that. The green creatures are obviously superior, although slightly slower in this hard hitting deck. Out of the sideboard we'll use Pillage for problem lands or artifacts, Mystic Melting in a similar capacity but also to destroy enchantments we can't deal with (Dystopia, Necropotence, Stormbind, Circle of Protection: Green). Pyroblast helps override enemy permission magic, and Stunted Growth can punish a control player by allowing us to tempo too much damage into play before they can recover. That gives us a good summation of the power decks in this block format. I'll put together additional lists soon and continue to build the archive in the coming days. 0 Response to "Block Constructed Magic: Ice Age Block, Part II"